Vienna’s Karlsplatz has been under construction for decades and it remains to be seen if it will ever be finished. The most important aspect of this continuous making and remaking of the large and centrally located square is that it clearly demonstrates the dynamics of urban contemporaneity. Karlsplatz tells a rich and conflicted history that is written in the language of architecture and urbanism. From the 1960s onwards, art, in the broadest sense of the word, has become part of how the production of urban contemporaneity, and its normalization, played out on Karlsplatz, both on its surface and in the underground. Karlsplatz is located at the edge of Vienna’s center, the Inner City, and connects to a traditional open-air market, the Naschmarkt. Visually as well as spatially, Karlsplatz is held together by a string of buildings hosting traditional and long standing religious, art, cultural and educational institutions dating back to the seventeenth, nineteenth and twentieth centuries respectively. Among these are the historicist exhibition building of the Austrian Artists‘ Society, the Vienna Künstlerhaus , the art-nouveau icon of the Union of Austrian Artists, the Vienna Secession, the 1950s postwar reconstruction era building of the Vienna Museum, the baroque monument of Karlskirche (St. Charles Church) and the neo-classicist building of the Vienna University of Technology. These buildings form a panorama holding the square together. Karlsplatz is also one of Vienna’s major transportation hubs with more than a 100.000 of daily commuters using the underground passages and tunnels of the three different metro lines that cross here. Both, above and under ground Karlsplatz boasts a number of different uses and a large and mobile urban public. Viennese architect and urban planner Otto Wagner derisively and pejoratively referred to the square as ›Gegend‹1, which roughly translates into neighborhood, area, surrounding environment, landscape or terrain. Wagner uses ›Gegend‹ as a concept that functions as a spatial marker to denounce the lack of qualities and the missing boundaries. It stands for the unplanned and vague. It comes with fuzzy edges, blurry contours and unclear borders. ›Gegend‹, therefore, is in dialectical opposition to the square that stands for the planned and precisely defined with clear borders, distinct edges and flanked lines of demarcation. In Western urban planning and equally in Western thought, especially in philosophy and political theory, the square has come to be understood as the public spatial representation of ruling regimes. At the same time, the square is commonly held as the site of political protests and demonstrations, as the site of emerging publics or counter publics.2»Bodies in Alliance and the Politics of the Street«, in Sensible Politics. 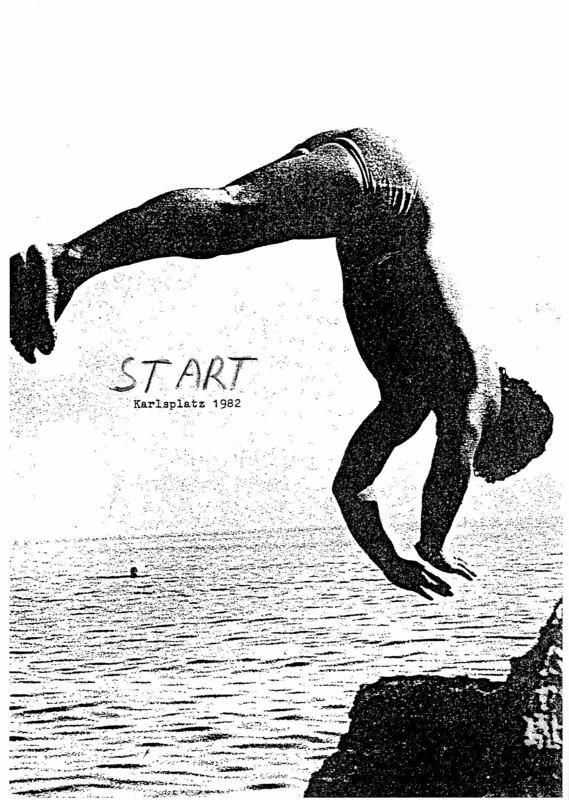 The Visual Culture of Nongovernmental Activism, eds. Meg McLagan and Yates McKee (New York: Zone Books 2012), ›Gegend‹ or area remained quite vague and cannot boast a prolific history of political theory.3The politics of the square are therefore quite different from the politics of the ›Gegend‹. Paradoxically, it is this very unfinished character of never having quite made it to meet the representational expectations of a square proper that rendered the Karlsplatz the perfect terrain for testing urban contemporaneity. The vague ›Gegend‹ rather than the defined square, as I will show in the following essay, has been Vienna’s testing ground for the construction of urban contemporaneity since the late 1960s. This essay is on how under construction has come to be understood as the template of urban contemporaneity. Speaking of urban contemporaneity rather than contemporary urbanism, places the emphasis on the chronopolitical dimension. Not only the production of space matters, but equally the production of time. Cities are under pressure to prove themselves as contemporary and urban. Cities have to become, and crucially, remain contemporary. If they fail to perform, they fall behind, they become anachronistic or outdated. Therefore, cities have to invest their resources, both material and immaterial, into updating. And, equally important, this update has to be rendered visible, spatial, and legible in order to gain public traction. Public space functions as one of the key communicators of this chronopolitical regime of updating. Therefore, public spaces, such as the square, embody the politics of time. This embodiment has to be both constructed, materially and rendered credible, immaterially. The dialectics between material/immaterial is one of the pivots of contemporary art. Contemporary art is a chronopolitically active agent.4Art signals contemporaneity on different levels: it has the capacity to locate contemporaneity in the urban space, to embody contemporaneity materially and to express its promise as well as its controversial and conflicting ideas. Therefore, art is dealt a dual function in the process of making the urban contemporary. Art has the capacity of making the urban contemporary and it equally has the means to make this making public. Thus, art becomes the public’s proof for the process of producing urban contemporaneity. Art as proof of urban contemporaneity again, is dealt a dual function. Art can be affirmative or critical of these processes. Paradoxically, both, affirmation and critique, can be understood as proof of urban contemporaneity. 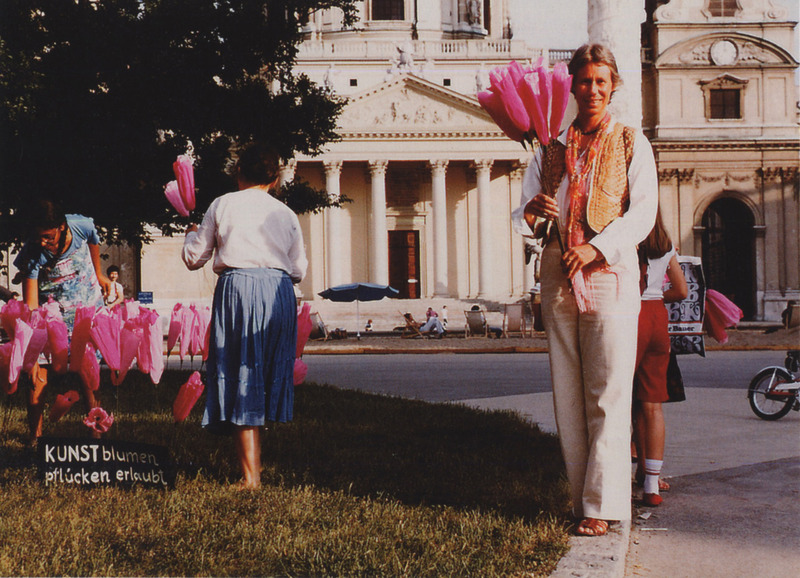 Therefore, art is at the same time implied in the most efficient aesthetic normalization of urban contemporaneity and in its most radical critique.5This essay focuses on Vienna’s Karlsplatz as an exemplary aesthetic testing ground where the processes I have laid out above are playing out. I will establish a temporal sequence of operations that introduced measures of revitalizing the square and turning it into contemporary public urban space. Art is implicated in contemporary urbanism, both acting toward its normalization and counter-acting its normalization, both fuelling its constructions and undermining them. This essay asks what is at stake in the relations between the urban, the contemporary, and the art. These relations are always under construction. Therefore, under construction is not the exception, but much rather, and paradoxically, the blueprint for rendering normal the making of urban contemporaneity.6Aesthetic experiences provided by art help these construction processes and make them appear normal to the public. At the same time, art publically counter-acts and critiques the normalization and subversively undermines the ongoing constructions. I will now proceed with a description of the material and immaterial operations that are part of the continuous process of construction that has been redefining Karlsplatz since the late 1960s. Most of the examples chosen have been become realized, one of the examples remained an utopian design. Some of the examples are large in scale, enormous in investment of public money and long lasting in impact. Some of the examples are small in scale, modest in investment of public money, yet equally long-lasting in impact, as I want to argue. In tandem with the concrete examples I will draw out how the arts are implicated in the making of urban contemporaneity. I will focus on the paradox of the public function of art, at once acting in favour of and counter-acting normalization. My analysis starts from the assumption that the examples chosen render legible the function of aesthetic production, in the broadest sense of the word, to mobilize the required changes brought upon by urban revitalization in order to produce contemporaneity. I will follow Karlsplatz under construction from the 1960s through the 2000s with an emphasis on the late 1960s, the early 1980s and the mid 2000s. »Karlskirche is not a backdrop for weddings, the church is above all a sculptural work of art.«7 Bernhard Leitner, Friedrich Schindegger and Herbert Purschke submitted their contribution to a public search for ideas how to transform and improve the immediate surroundings of Karlskirche. They intended it to be both a radical provocation and a serious proposal. Their focus is on the church as a monumental baroque sculpture which they confront with six monumental parking towers for a number of 1134 cars. The team argued that the new automobile city should not hide its reality, but much rather develop and show a contemporary equivalent to be both a competent spatial competitor with the baroque past and an expression of the contemporary conditions of the most recent and most dramatic changes in urbanization wrought on by the automobile. 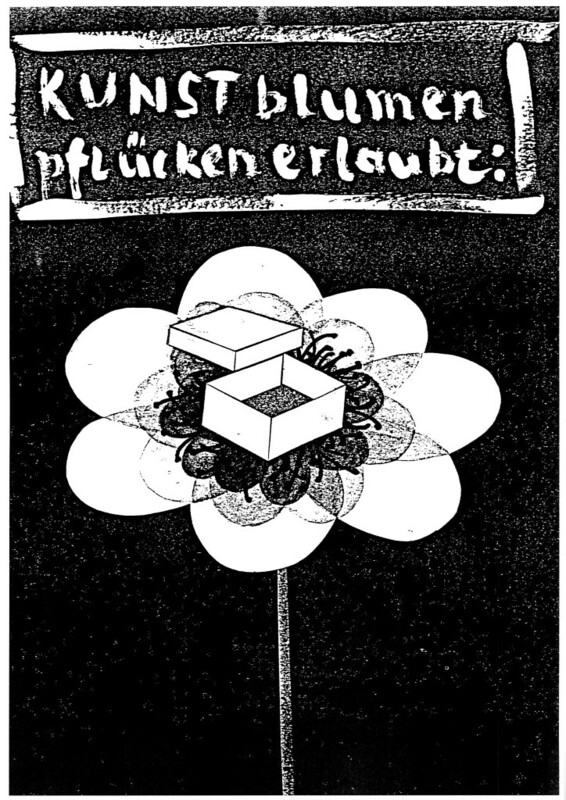 Even though Leitner, Schindegger and Purschke were very aware of the fact that their proposal did not stand a chance of realization, they regarded it nonetheless a profound and well thought-out contribution showing how contemporary architecture should dialogue with monumentality, both past and present. The team understands urbanization to be profoundly transformed by the mass car culture after World War II, they conceive of the construction of six monumental parking towers as a powerful manifestation of this contemporary urban culture that does not shy away from showing what it is based upon. In retrospect I understand their unrealised proposal to hold the key to understand urban contemporaneity of the decade of the 1960s. At first glance, their idea seems to be shocking, provocative, and radical, yet, at closer inspection, it turns out to be quite owed to what was considered normal at the time and took normalizing to a monumental scale. The team was in search of a striking visual and material expression of the contemporary city. They wanted to create a powerful image of this new contemporary city, they wanted this image to take center stage, and they also wanted to point to the fact that the present-day belief system of material advancement, consumer culture, and car-centric urban life should not shy away from making bold urban statements. All this together I understand as an attempt at normalization of contemporary belief, read value systems of capitalist consumption, through aesthetic measures. While the proposal of the monumental parking towers normalized a city fuelled by cars and a lifestyle based on the capitalist mobilization of commodities, the »action« of the students normalized contemporaneity as taking place. Urban squares need urban life. The aesthetic expressions of this urban life need to be performative and highly visible in nature in order to make themselves heard, seen, talked about, shared with an urban public. What was not yet fully understood at the time and resulted in police intervention, has become the desired and normalized condition of the contemporary square. These two strategies, the iconic and sculptural monument and the »action«, the aesthetic performance of urban life, are not mutually exclusive. In hindsight, we can decipher both of them as the blueprint for urban contemporaneity. Their normalization demands that they are not only accepted but actively promoted by the elites of urban power, by decision-makers, policy-makers, administrators and developers. Equally, they have to be performed again and again by aesthetic producers, like architects, artists, film makers and others in the cultural field. And, most importantly, they have to be valued and understood as the norm by the urban public – one has to both achieve and celebrate in order to let one’s city not fall behind in terms of urban contemporaneity. 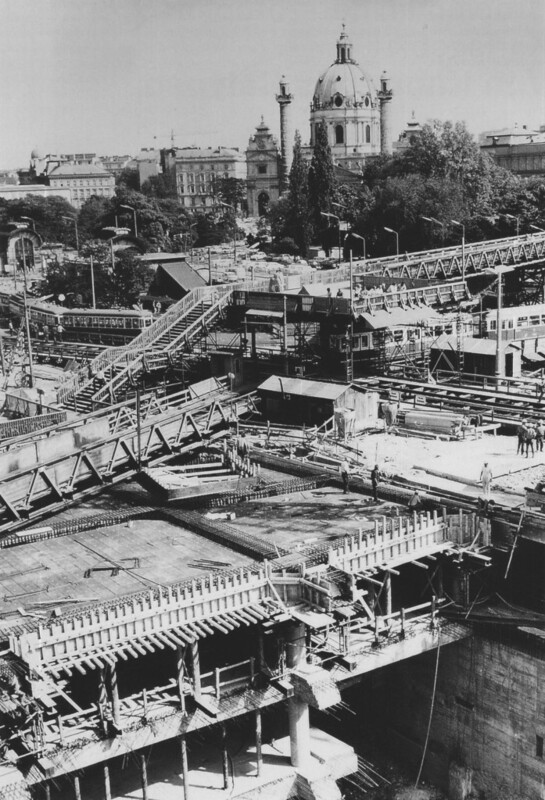 In 1969 on November 3rd, the construction of the U 1, Vienna’s first underground began at Karlsplatz. The construction process lasted until 1982. The construction site became an urban attractor. The public came to visit and to witness. A visiting platform was built so the public was able to walk over the construction site and see what was going on in the underground. The Karlsplatz construction site was soon celebrated as Europe’s largest construction site of the time and became a family destination. The construction site operated on the gains in urban contemporaneity and future normalization. Vienna, even though the city looked back on the proud history of urban infrastructure of a network of trams and urban trains, was late in adopting an underground and in investing in this major infrastructure project. What is of interest in the context of this essay, is that the construction site helped put Vienna on the Hollywood map of film locations. Shot in Paris, Washington D.C. and Vienna, the 1973 film Scorpio the Killer made spectacular use of the enormous construction site. Burt Lancaster and Alain Delon chased each other through the labyrinth of the construction site. The film brings together urban infrastructure under construction and its aesthetic surplus value. Karlsplatz became a Hollywood destination which in turn put Vienna on the global map of circulating Hollywood imagery which showed it as a contemporary city with a massive infrastructural update in full swing. Thus far, I have analyzed art in a broad sense, ranging from site-specific architectural utopias to live actions in public space and Hollywood film. With the metro completed, the City of Vienna turned its attention back to above ground and earmarked Karlsplatz as a test site for aesthetic appropriations, that were commissioned by the Vienna Festival (Wiener Festwochen). A number of art projects that, in retrospect, can be understood as a turning point in how strategies of urban planning and festival programming joined forces. A robust and functioning public has to be turned into a public that can take pleasure in difference and appreciate a different kind of pleasure. Testing what is normal becomes the task assigned to visual artists. Officially commissioned and sanctioned by the City of Vienna and its Vienna Festival in 1982, the artists created the »Open Karlsplatz« (Offener Karlsplatz). The artists group START envisioned spaces to play, free zones not based on the prevailing consumption imperative. Normalization comes at a price. Artists argue that their art has the potential of simplicity, but it also has to be simple in order to be understood by many. Equally, artists argue that their art, that clearly demonstrates the capacity of producing the public needed for a contemporary urban square, can also achieve free zones outside of the imperative of consumption. Simplicity is equated with mass-compatibility which ultimately renders the many in opposition to the radical few, a role still reserved for artists, architects, aesthetic producers, intellectuals, who refuse mass-culture dominated by capitalist commodification. This paradox constitutes the public dimension of contemporary art. That is what we have come to understand to be normal. Contemporary art speaks the language of this paradox. 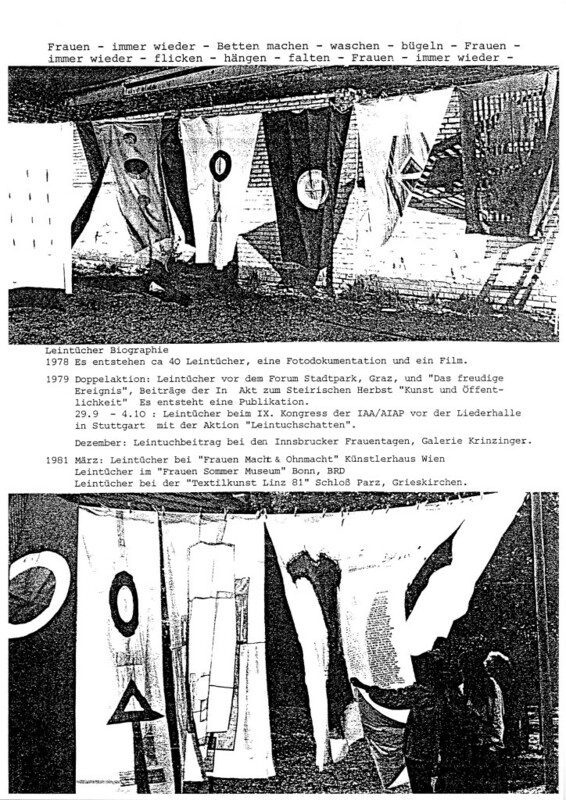 While the Open Karlsplatz of 1982 celebrated a non-homogenous and fluid public on the square, above ground, the underground passages and tunnels in fact witnessed the emergence of a non-homogenous and conflicted public. In the 1980s the underground passages of Karlsplatz became the central location for Vienna’s drug scene. My last two examples date to the 2000s and clearly demonstrate the understanding of the normalizing effects of art with regard to revitalization and urban contemporaneity. Both, the officially commissioned public art and the critical exploration of art’s public function by students of architecture, share this deep and profound understanding of the entrenchment of art. The paradox reappears. Art can be put to work in favor of normalization, it can also reveal and counter-act processes of normalization. In 2005 students of architecture at the Academy of Fine Arts in Vienna, who had met each other in a studio led by Eyal Weizman, then a guest professor at the Academy, formed the group KEUK, Kommission zur Erhaltung der Urbanzone Karlsplatz (Commission for the Preservation of the UrbanZone Karlsplatz). We can trace their approach back to the actions and activity-based proposals of the late 1960s. Yet, there is an important difference. While the architects and planners of the 1960s understood their measures to enable public urban life, KEUK set out to ensure that the urban public life that shaped the everyday of Karlsplatz would not be sanitized, evicted, in short normalized. They did not conceive of their actions so much as the creation of a different urban future, but rather of a claim to a conflicted and difficult urban presence. Their aim was to counter-act the official policy of the City of Vienna to transform Karlsplatz into Kunstplatz Karlsplatz. 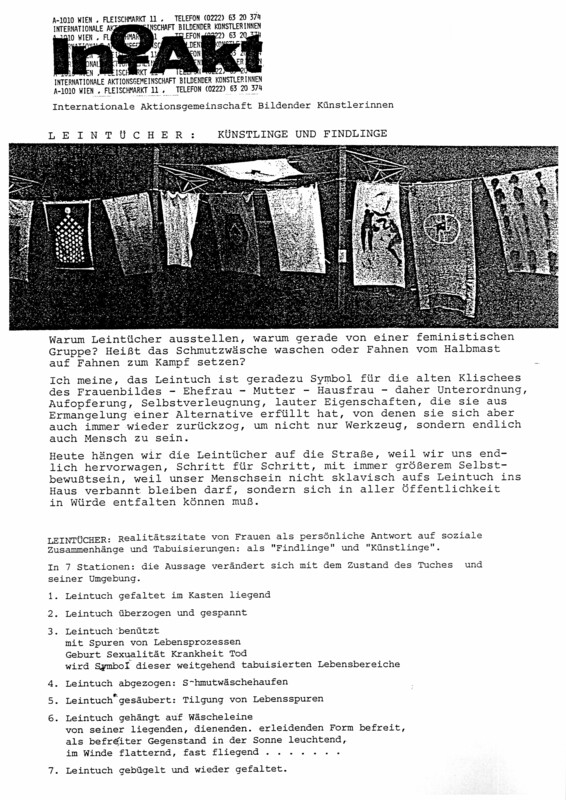 KEUK practiced artistic interventions intrinsically opposed against the official policy of KÖR, Kunst im öffentlichen Raum (Art in Public Space). They aimed their ideas and their actions against art more and more strategically employed as a normalizing factor of a new wave of urbanization and contemporaneization. They came up with the idea to install outdated telephon booths on Karlsplatz, above ground, to provide shelter for drug users. They also turned back to use urban history, again in its global dimension, as a source of inspiration and aimed to mobilize the affective identification of the public with a complex and non-homogenous Karlsplatz. They produced T-Shirts and buttons that read I Love Karlsplatz. This paid hommage to an urban image campaign in 1970s New York when the city was marked by crime, decay, and corruption and in general considered to be on the verge of collapse. In the 1970s, I love New York, was an act of affirmation, a testimony of the affect of love for a decaying and difficult city. KEUK wants the same from today’s public. The affect of love and the affirmation of a place in its current state, not its potentially polished and updated current future. I love Karlsplatz is therefore a chronopolitical proclamation of resistance to a normalized Kunstplatz future. Canadian artist Ken Lum’s installation transformed the dark and shabby passage into a well lit, bright, and clinically clean space. KÖR Kunst im Öffentlichen Raum Wien (Art in Public Space Vienna) describes Ken Lum’s piece as follows: »The use of mirrors combined with writings in the Westpassage Karlsplatz in Vienna represents a further development of Ken Lum’s oeuvre, which has, right from the beginning, circled around issues of identity, language and culture. Here, in his media installation »Pi«, Ken Lum deals with the subject of statistics referring to the world with numerical information. 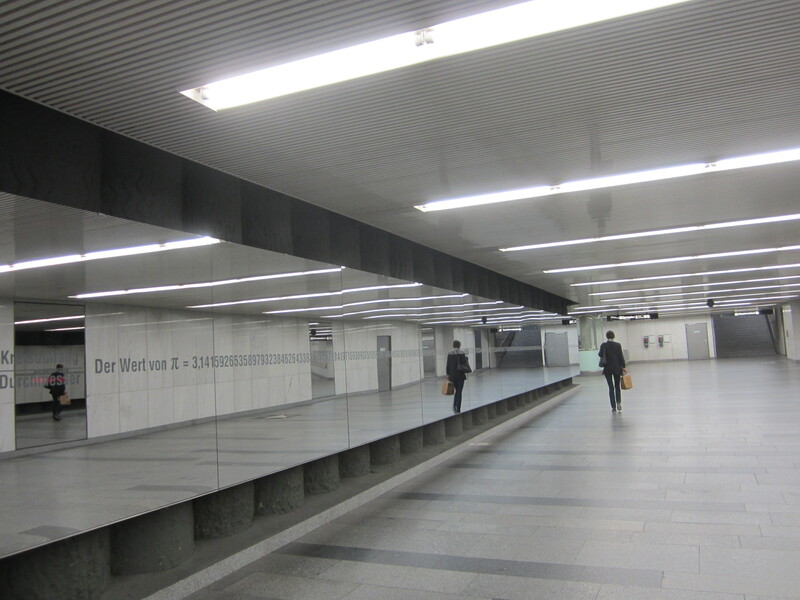 14 mirrored panels are fixed to the side walls of the passageway, each furnished with a piece of etched writing. LED displays are mounted under each of these headlines. Based on statistical data previously surveyed according to socio-scientific standards as well as mathematical forecast models and their corresponding algorithms, the numbers visualized there are constantly changing. (…) Passers-by see themselves mirrored in the various panels in the subterranean passageway below the Karlsplatz in Vienna. 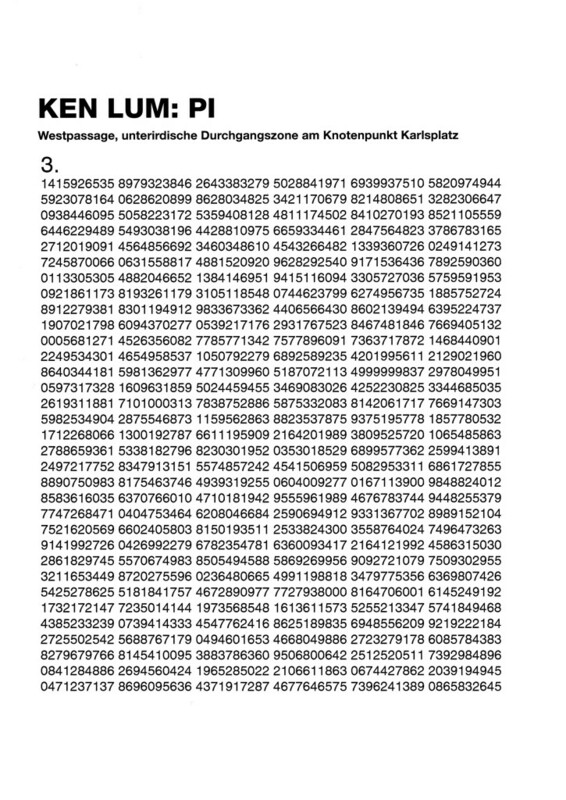 While reading the up-to-date number on the digital counting device, they are – as readers – being linked to the number in a performative sense.«16 The individuals are mirrored as public, the public is mirrored in numbers. The dialectics between material/immaterial are playing out in Ken Lum’s piece. Its critical impetus is marred by its side-effects of normalization. 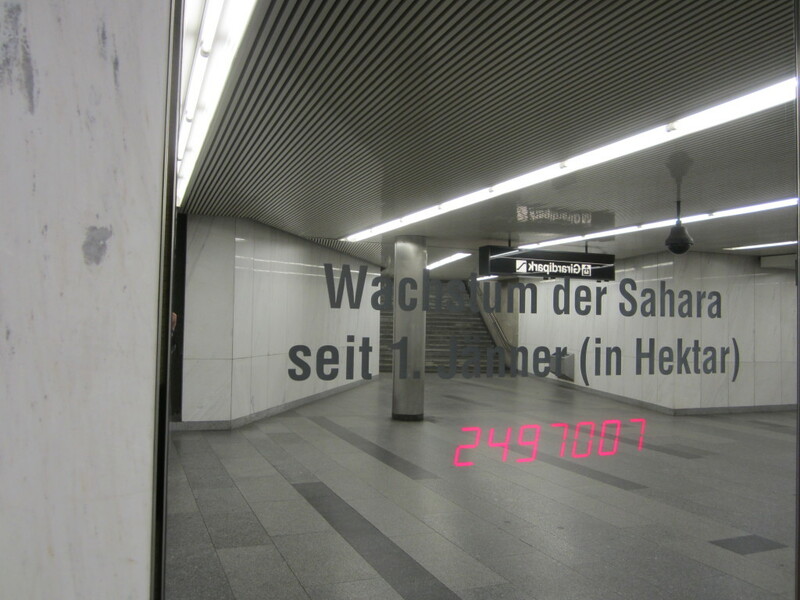 The numbers of homeless people evicted and drug users disappeared from the underground passage could be added to the statistical data displayed on the LED displays of Pi. By the first decade of the 21st century, urban revitalization has, as we have just seen, fully embraced a globalized production of large-scale public art as a key strategy to showcase robust and durable urban contemporaneity. 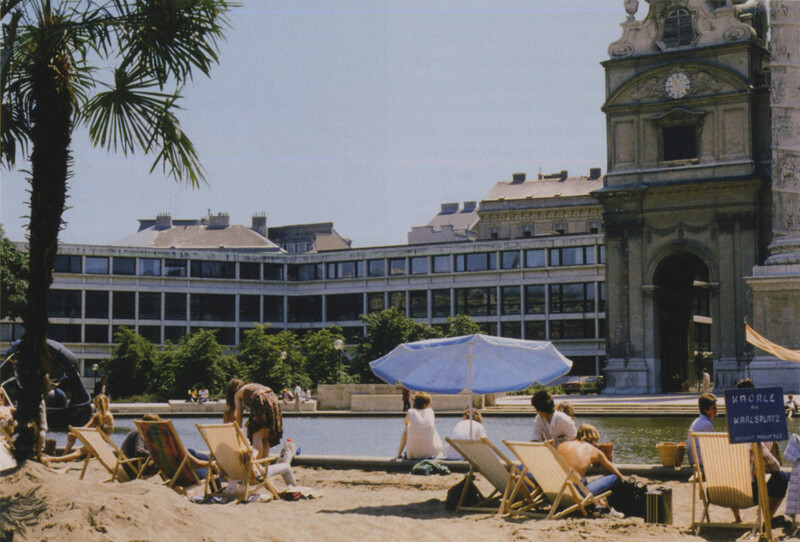 Kunstplatz Karlsplatz aims to finally turn the ›Gegend‹ into a square proper. The masterplan Kunstplatz Karlsplatz fully embraces contemporary art as a strategy to create its defining contours and to flank its borders. The update of Karlsplatz into a Kunstplatz is written in the language of art’s contemporaneity and its aesthetic normativity. It is meant to cultivate certain publics, both local inhabitants and international flows of tourists, and to exclude others. Contemporary art has therefore been fully incorporated into the chronopolitical dimension of urban masterplanning. 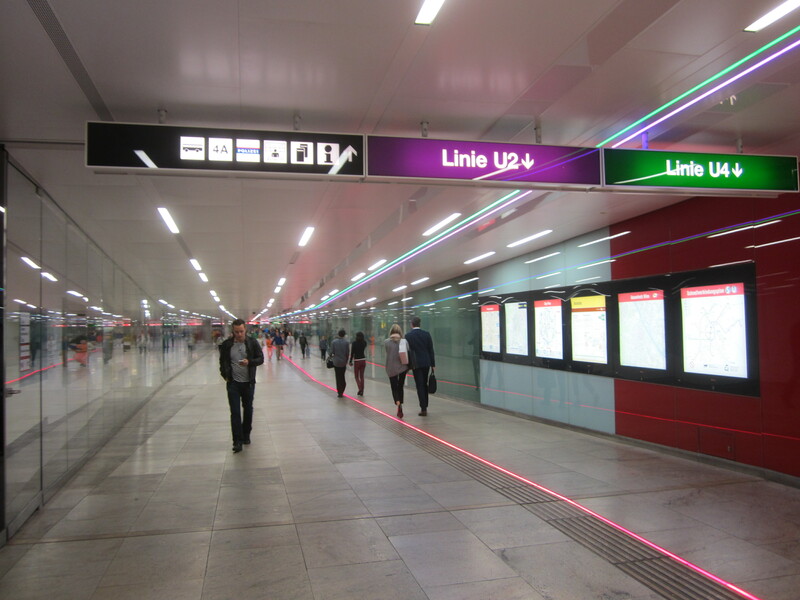 The renovated Karlsplatz Passage (2013) bears a close resemblance to the aesthetics and materials constitutive of Ken Lum’s Pi. Contemporary art is expected to take the lead in mastering urban contemporaneity. At the same time, contemporary art practices continue to question and to counter-act this aesthetic normalization. They make their critique public on the Kunstplatz by retaining traces of the previous Karlsplatz referred to as ›Gegend‹. Critique renders Karlplatz unfinished, which paradoxically, extends its function as a public testing ground of urban contemporaneity. Iris Young, “Impartiality and the Civic Public”, in: Seyla Benhabib and Drucilla Cornell (eds.) Feminism as Critique (London: Polity Press 1987), 56-77.